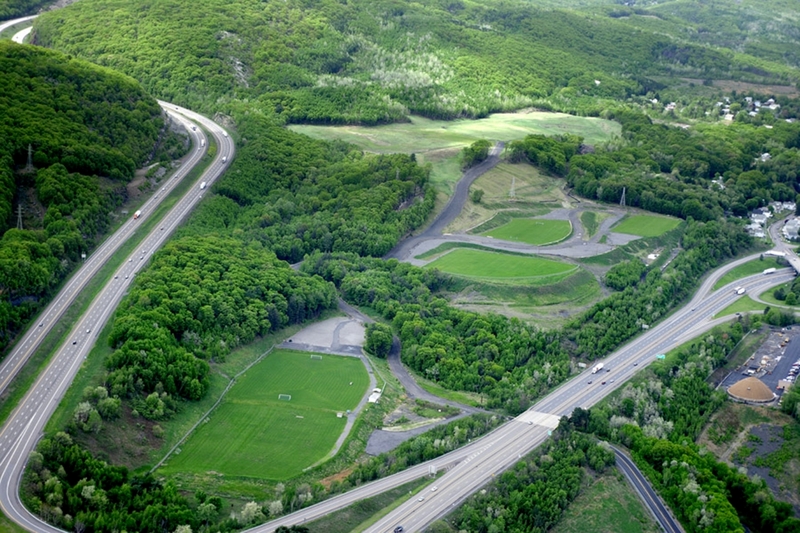 Early in its work, in its Lower Wyoming Valley Open Space Master Plan (1999), Earth Conservancy recognized the need for centrally-located playing fields in the Hanover Area community. EC resolved to turn a mine-scarred wasteland into a site where people could gather, play sports, and enjoy the outdoors. The result was the Greater Hanover Area Recreation Park, a 65-acre recreational area in Hanover Township, adjacent to S.R. 29. Because of the project’s scope, work was divided into two phases. Phase I consisted of a 15-acre tract on which two multi-purpose athletic fields, a basketball court, and parking area were constructed. Work was completed in 2002, and in 2004 EC donated the fields to the Greater Hanover Area Recreation Park Commission. At the time, approximately 600 youth used the fields for soccer seasonally. Phase I’s success generated demand for more park space. In response, EC initiated Phase II. Phase II encompassed approximately 45 acres of damaged lands, and involved the construction of six additional multi-sport fields for softball, baseball, soccer, and football, as well as increased parking and amenities. The expanded park system now hosts another 1,500 children throughout the year. Greater Hanover Area sports teams also utilize the fields. As with Phase I, these fields were also donated to the park commission for ongoing operation and maintenance. The recreational area also includes the Sugar Notch Trail, detailed here, which is adjacent to the proposed Sugar Notch residential area. The design decision to combine the park, trails and residential area exemplifies Earth Conservancy’s commitment to providing the lower Wyoming Valley with environmental enhancements while serving the needs of the community.